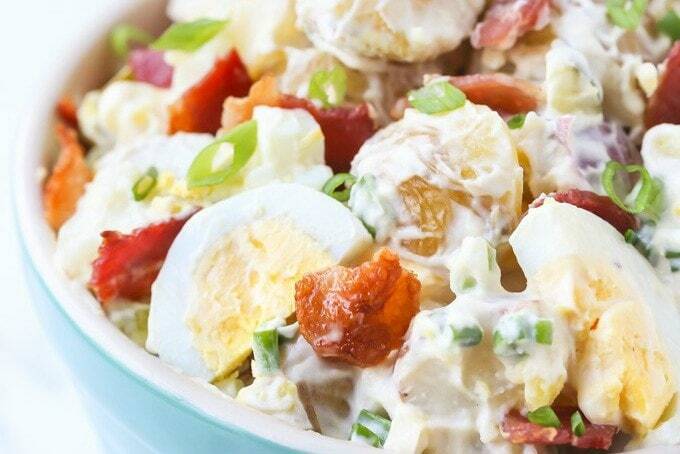 The BEST Potato Salad with Bacon and Egg recipe ever!! It’s loaded with yummy bacon, egg and pickle!! Can be made Whole30, gluten free too! You can prep it ahead of time by cooking the potatoes day ahead and chilling them in the fridge. Then if you prefer you can buy ready cooked bacon to save a little time, or you can use my preferred method to cook it which is on a rack over a sheet pan in a 400F oven for about 20-25 minutes until it’s crispy. So the first step in making this potato salad is to NOT peel the potatoes, that’s right, no peeling! I prefer to use baby potatoes, or fingerling potatoes so that I can keep the skins on. If you have a steamer basket insert for your pans, I think that’s the best way to cook the potatoes. If not you can just boil them but do make sure you don’t overcook them. Once the potatoes are fully cooked you want to cool them down before you add the mayonnaise and seasonings, you can put them in the fridge to cool them more quickly if you need to. If the potatoes are still warm when you add the mayo it may melt. All of the ingredients for this recipe should be easily found at your local grocery store. Potatoes are now allowed on the Whole30 diet, so if you want to make this Whole30 compliant just leave out the dill pickles and use a suitable Paleo mayonnaise. You can mix the mayonnaise with half sour cream if you prefer, but I just use mayo as I eat dairy free as well as gluten free. There are three types of potatoes, waxy, starchy, and all purpose. The latter has varieties that fall somewhere in the middle of the other two. Waxy potatoes have thinner skins and really are the best variety for potato salad. As mentioned above, fingerling or new potatoes are my favorites for potato salad. Red potatoes work too, I don’t like them with the skin on, but I know others don’t mind it. 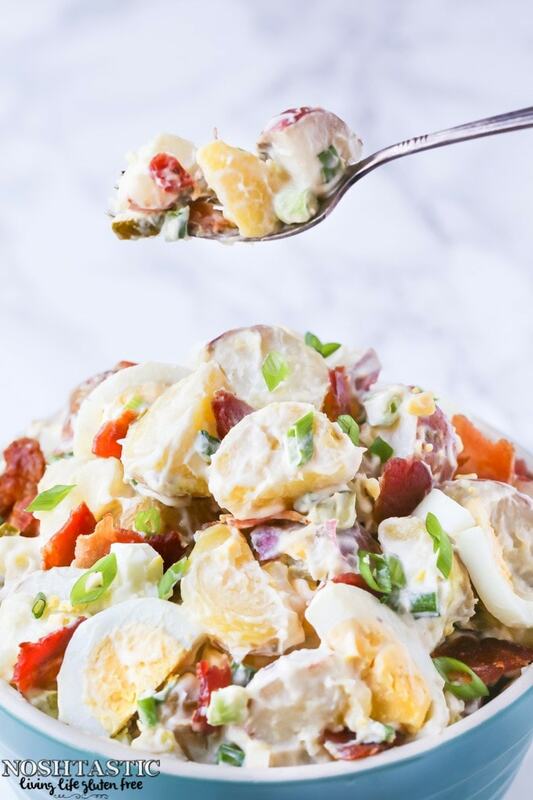 All purpose potatoes such as Yukon Gold also work for potato salad and hold up well during cooking. Starchy potatoes, such as Russets, are typically not suitable for potato salad as they tend to fall apart so I would opt for another variety. 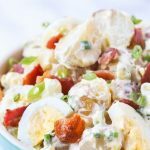 Potato Salad is such a ubiquitous side dish, and personally speaking, I could eat it with almost anything! It does go particularly well with grilled and roasted meat dishes, and is perfect to take to a picnic, cook out, or pot luck as a side dish. And where you have potato Salad, well, you also need some Slaw! This Sesame Coleslaw from Katie at Healthy Seasonal Recipes looks terrific! I love to eat it with my Grilled Flat Iron Steak, it’s so easy to prepare and cooks quickly on the grill. Another couple of options are my Grilled Paleo Lemon Chicken with Thyme and my Cuban Pork recipe, they all have wonderful marinades and taste fabulous! You guys!! 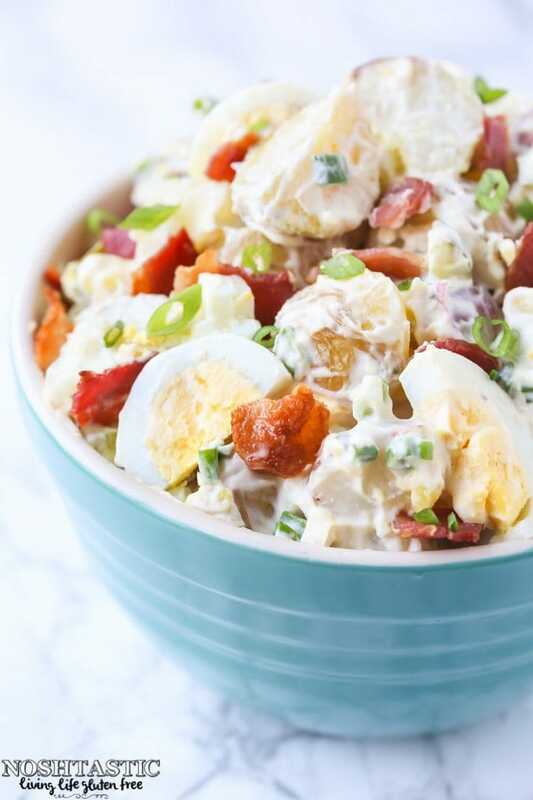 This is the BEST Potato Salad with Bacon and Egg recipe ever!! It's loaded with yummy bacon, egg and pickle, so, so good!! Cook the potatoes whole in a large pan of salted boiling water. Once they are cooked let them fully cool in the fridge. When they are cool cut them in half or into quarters (depends on the size) and add to a large bowl. Add the mayo mix to the potatoes and egg and fold in together with the bacon and chopped onions. Serve chilled. To make it Whole30 compliant - leave out the dill pickles, and use a paleo mayonnaise and mustard with no added sugar. Salad onions? Looking at your photo I’m assuming that’s chives? Looks delish and added this to my meal plan for this coming week. I’m sorry, I meant green onion, not chive…..I have never heard the term salad onion. I’m sorry Heidi! I sometimes forget what the American terms are for things are despite living here for eight years, lol! 🙂 It’s the same thing as a spring onion, green onion, scallion etc, there might be other names for it too. This looks amazing- what kind of mustard did you use? Thanks Abigail! I usually use french mustard as it’s mild and I like it the best, but any type will do. 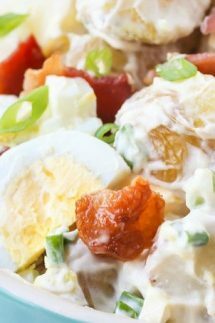 Your “Easy Vegetable Potato Salad” link is no longer found when I click on it through pinterest or facebook. Is there somewhere else I can find it? I updated my website last year and removed old recipes that I didn’t feel were great or were getting no traffic and that one didn’t make the cut I’m afraid and I no longer have a copy of it, I’m sorry!